Tiger Woods, who led the first round of the Masters for a while Thursday, finished in a group of 10 players tied for 11th. AUGUSTA, Ga. — The golf ball caromed through the upper reaches of the tree with such force it sent pine cones raining to the ground like hail stones, and the patrons along Augusta’s 17th fairway into full duck-and-cover mode. Tiger Woods’s errant drive spun to the ground and rolled back in the direction of the tee box, forcing those same onlookers into a backward scrambling retreat. “Folks, don’t touch that ball,” a course marshal warned once it had settled in the damp Georgia grass, directing the crowds around it to back up enough to make room for Woods’s second shot. “We’re not touching it,” one of them answered, as he jockeyed for position for an up-close view of what would come next. Woods walked up moments later, his caddie, Joe LaCava, beside him, and sized up the situation as you would expect. Chomping on some gum, Woods took a few phantom swings near the ball. He stood behind the shot, gazing into the distance, eyeing the path he’d like his ball to take. He asked for the few people still in his sight line to be moved (saying “thank you” as they did) and took a purposeful walk forward. Returning to the ball, he backed away again, took a few more practice swings, and finally set his feet to do it for real. With one powerful downswing and one resonant thwack, the ball soared off toward the green, carrying the hopes of a golfer, and a crowd, who wanted nothing more than to believe that it was headed straight for the pin. Just the way Tiger used to do it in the old days. 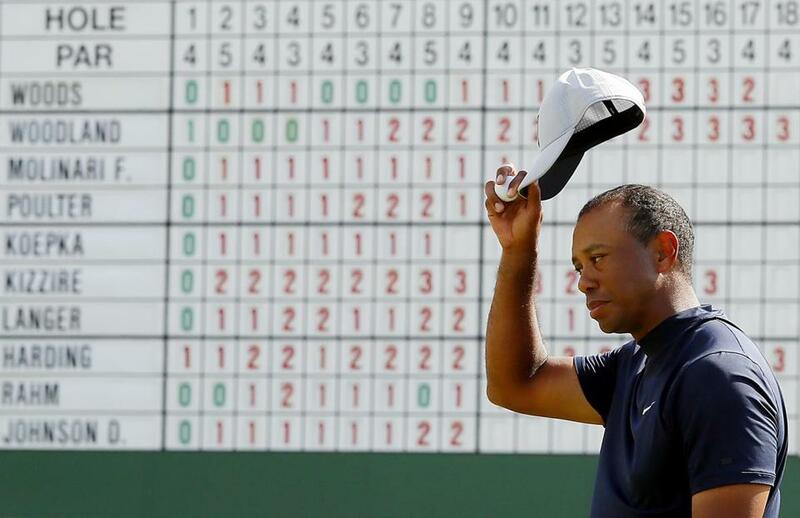 Only four holes earlier, Tiger already had channeled his best old days, a tap-in birdie dropping him to 2 under par, pushing him up the first-day Masters leaderboard in ways reminiscent of his four previous victories here at Augusta. And only three holes earlier, he’d done himself one better than that, drawing a Tiger roar of old when he drained a 25-foot birdie putt. Though it was the rescue shot out of the woods on his previous swing that would truly do the hard work in setting up the second straight birdie, it was the putt itself that woke up the echoes. Tiger had taken the lead. Fourteen years after he’d last earned a green jacket, he was in the lead. One year after he called it a “miracle” he was golfing at all, he was in the lead. Two years after he’d missed his second straight Masters due to injury, he was in the lead. A lifetime since he’d been near-daily fodder for tabloids, he was in the lead. Thanks to a putt he didn’t even expect to go in. The lessons Tiger has learned since last winning a Masters (and last winning a major, the US Open in 2008) have fueled our golfing conversations for years now, a tournament-by-tournament referendum on whether he can win a major again, whether, at 43, he has any real chance to get the four majors he needs to tie Jack Nicklaus’s record. What once seemed inevitable barely seems possible, but if he could somehow crack that major code just once more? What a fun ride that would be. The Masters has always been his best hope. It’s the first major of the year, when bodies are fresh and rejuvenated. It comes at the start of spring, when conditions are friendly and manageable. It comes with its familiar course setup, when experience is both teacher and guide. Could this be the year it happens? So here he stands, golf club high over his shoulders, eyes tracking the ball is it soars toward the 17th hole. It lands between two bunkers, just off the green. A par save would be something here, wouldn’t it? He chips it about 6 feet from the cup. Only this putt doesn’t drop. Woods rolls it just right, then taps in for a bogey that puts him back at 2 under. A par on 18 sends him to the scorer’s table with a first-round 70, good enough for one off the lead at the time. Soon, he would bolt directly to the practice putting green to try and reverse the few shorts ones that got away. But overall? He is happy. That the number wouldn’t stay as close to the lead as it had been wasn’t surprising, not as the winds died down across the late afternoon and some heavy hitters took turns cutting through it. There were young guns Bryson DeChambeau and Brooks Koepka moving into the lead, tied at 6 under, there was old friend Phil Mickelson dropping birdies like his own hail stones, five in the last seven holes to move into solo second place at 5 under. But Tiger sits comfortably in a group of 10 players tied for 11th. And remember this: He’s never finished outside the top 10 when he shoots below par in the first round. And in three of the four Masters he’s won, he opened with a 2-under 70.